At last, a new car. 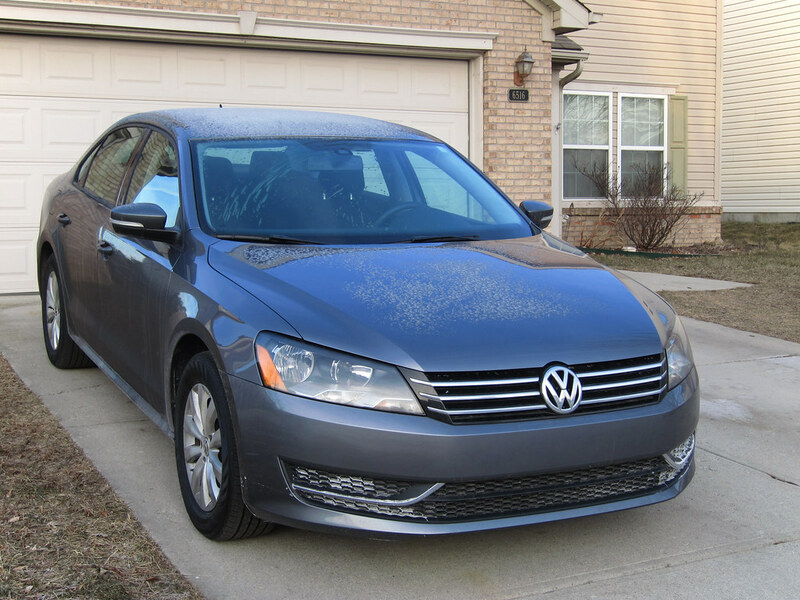 A new-to-me car at any rate: a 2013 VW Passat 2.5 S.
With that, my beloved Toyota Matrix is finally gone. I wrote its eulogy last September (read it here) after it developed several problems that would cost far more to fix than the car was worth. One of those problems made the car a safety risk on the road. But then I dragged my feet on selling it. In part, I struggled to let go of my baby. In part, other priorities kept winning over selling a beater car. In part, I wanted more from it than the $200 my mechanic offered me so he could part it out. But then late in January it became essential that my family have three safe and reliable automobiles. My wife and I both own Ford Focuses that, despite age and high mileage, are entirely roadworthy. I had to act, and fast, to replace the Matrix. My wife and I set a budget and I went shopping. That budget was low enough and time was enough of the essence that my purchase criteria were very broad: under 50,000 miles, good reliability reputation, four doors, usable back seat. I looked at a handful of cars and SUVs before coming upon this Passat. The back seat is cavernous. Our 6′2″ youngest son can sit back there with easily four inches between his knees and the back of my seat. Finally, a comfortable trip car for the family! The automotive press panned the 2.5-liter, 5-cylinder engine for lacking power compared to the competition. I’ve not driven other midsize sedans, but this Passat has plenty of scoot for me, especially when I drop the transmission into Sport mode. Whee! Fusions and Accords and Camrys must be blazing quick. The press also criticized the Passat’s generic styling. Can’t say they’re wrong. After so many years driving inexpensive economy cars, I feel like a real grown up driving this large, comfortable car. But it feels like a wasteful amount of car for me to drive alone to and from work, which is what I use it for most. I take solace in the fact that it gets gas mileage at least as good as my lamented Matrix and my Focus! Oh, and the trade-in value on a beater 2003 Toyota Matrix: $750. Score! Congrats, Jim! I know what you mean about suddenly driving around in a big car after having piloted a small car for a long time. I used to complain about having to reach waaay over to open the windows. But now everything has power windows, so, no problem! IKR? My first Toyota Matrix had crank windows and it felt like such a throwback. I am actually sort of worried that the Passat won’t maneuver down the old alignments as well as my Focus or my lamented Matrix. Fortunately, I still own the Focus and can get it out for just such a trip! I loveit! I had a similar experience when a nephew needed to use a telephone at my mother in law’s house a number of years ago. The phone had a dial and he had no clue what to do with it. I remember — vividly — the first car I saw with power windows! My dad’s best friend had an early Buick Riviera, probably a ’67. I was fascinated with those switches! Can’t go far wrong with a VW! Four of the sevens cars I’ve ever owned have been VW, well, and VW family – my current one is a Seat, which of course, like Skoda and Audi, all have essentially the same VW engines and running gear. And therefore VW reliability. My wife has a Touran too, amazing things, being somehow compact and manoeuvrable enough to feel like driving a car, but still with seven seats. Rather frugal too, the 1.6TDI engine returns 48-50mpg even with the relatively local trips it’s used for – it gets well into the 50s on a long drive. What’s on the bonnet and roof of your Passat Jim – frost? Snow? Wow, you’re a VW fanboy! I’ve always kind of wanted one but the right one had never come at the right time. A VW wasn’t even on my radar this time until I came upon this one. Here’s hoping it’s as reliable as everybody says. That’s frost on the car. It’s cold here now! My car history: Chevrolet, Mercury, Toyota, Toyota, Toyota, Ford, VW. Not including the cars I’ve bought for my wife. Came from my dad, he had hundreds of cars (he was a dealer for much of his life) but swore by the VWs. I had an original c1983 Golf GTi in my 20s. Fantastic fun! When I started dating my wife I had a Honda CRX SiR two seater. These days family dictates something more sensible, hence the Seat Altea and VW Touran! Congrats on the new ride! If you have trouble getting comfortable in a car so large, you can try my plan: alternate between a Chrysler Newport and a Ford E-150 van for a year or so. From there, anything else you drive will be practically a sports car. Isn’t it true that some cars can make you feel like a grown-up? I still can’t decide whether I like that feeling or not. It is all relative, isn’t it! I used to drive big Econoline vans every day, and then step into my Ford Pinto and feel quite vulnerable. A truly terrific and inspired choice! Having driven both a Camry, a Fusion, and a Passat of the same vintage (2014ish), the Passat is the best of the bunch. It’s underrated in my opinion. Your comment about driving a car of this size made me chuckle, but it’s all a matter of perspective. Our Passat is parked alongside an F-150, an E-150, and a Ford Galaxie; we long ago concluded the Passat is as small as we could go but it is as nimble as can be. Looking forward to hearing of your future experiences with it. It’s good to know you think the Passat was best, because I didn’t drive any of the competition! I was actually leaning toward smaller cars/SUVs. I had my eye on a Kia Sportage and a Toyota Corolla when this came available. The Sportage was considerably less expensive and I would almost certainly have bought it had the dealer not sold it just as I walked in the door. Good for you Jim, you deserve it. Very nice. I rented one a few years ago during one of the many times my Ford Focus was in the shop, it was by far the nicest car I have ever driven. Wow, that’s really saying something. The Passat feels super tightly screwed together, to be sure. The company I do marketing for owns a VW dealership, so I can confidently tell you that this model year of Passat is a very good car. I drove cheap economy cars for the last 15 years because when I looked at where I needed my money to go post-divorce, a nicer car just didn’t make sense to me. Right now I’m firmly in the paying-for-college years and so I’m still choosing to be very careful with money. I was surprised that my budget bought me this much car. It’s just the base model — no leather, no infotainment — but it’s still extremely well equipped. I wish its styling were a little more exciting but other than that it’s just great. It’s very good to know that you give this car the thumbs up! Jim, those VW are super boring look wise, but are one of the most reliable and cost effective cars! Since seems you keep your cars until they are near clunker stats, should last you for a while. Great score on the trade in! Here’s hoping it gives me 8 or even 10 years of good service! Ich gratuliere dir zu deinem neuen Auto, Jim! I agree with Victor that VWs may not be the sexiest-looking cars on the road, but they do run forever. (If the chassis of my 15-year-old Golf hadn’t rusted out, I’d probably still be driving it.) So … a toast to your sweet memories and your beloved old Matrix. And here’s another toast to your shiny new wheels! I love cars that run forever! It’s my favorite kind of car! BTW your closest Krown rust proofing location is Versailles, Ohio. That stuff makes car bodies last forever! Nice, the only improvement I would desire is a manual transmission, but that’s just me. I’d have gotten a manual in my Dodge Caravan if it was available. I assume that’s frost on the roof and not sunburned clearcoat? I think the Passat is a bit generic but still quite a handsome vehicle for a man of your stature in life Jim. Capable dignity. I was thinking of your late great Matrix the other day, I folded the seats fully down in my newish Focus hatchback for the first time and was pleasantly surprised at the flat floor and big volume. I looked it up and it’s about 80% of the Matrix’s cargo volume. It’s just frost. Cold days here! I’m pleased to hear that the current Focus has a flat load floor and so much space! Too bad I find the front seats to be so first class awful. Had I not, I would have bought Dad’s ‘12 from him when he sold it last year. I miss going for drives on wide and uncrowded Canadian roads. I used to have a car here in Korea but sold it because it’s not really necessary in a Korean city. Lots of buses, cheap taxis, etc. Also, my stress levels were off the charts. Tiny parking spaces, narrow roads, too many cars for such a small place, traffic laws that mean nothing to most of the population (that yellow line in the middle of the road is just to make it look pretty, right? ), yearly taxes that run up to a thousand dollars depending on engine size, and high fuel costs. I’m ashamed to say that my wife learned too many English curse words from me by sitting in the passenger seat. I did have a nice vehicle, though. A Sssangyong Musso Sports with a Mercedes 5-cylinder Diesel engine in it. What a beautiful sound that thing made . . . . I love to drive. But I also would love to not need a car. I’m full of contradictions in terms. Always admire the perspicacity and wisdom of the guy who lets someone else take the “hit” on the new car bit. I bought myself one new car. It was kind of fun to drive away in a car with 16 miles on the odometer. But really, it wasn’t worth what it cost.